Mindful Bodies appreciates your continued support! Please use #mindfulbodies when making posts about Mindful Bodies events on social media sites. 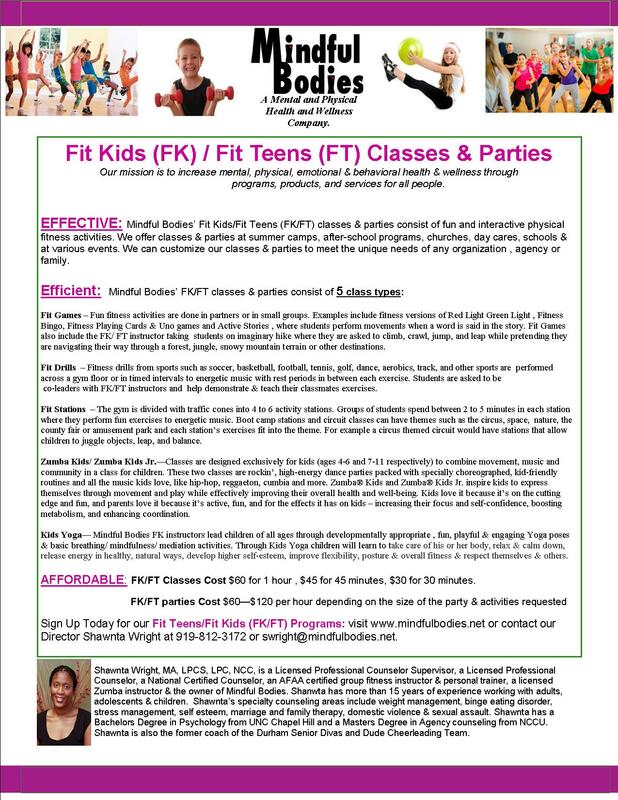 Mindful Bodies offers the Fit Kids/ Fit Teens program which includes 5 class types (Fit Games, Fit Stations, Fit Drills, Zumba Kids & Kids Yoga). 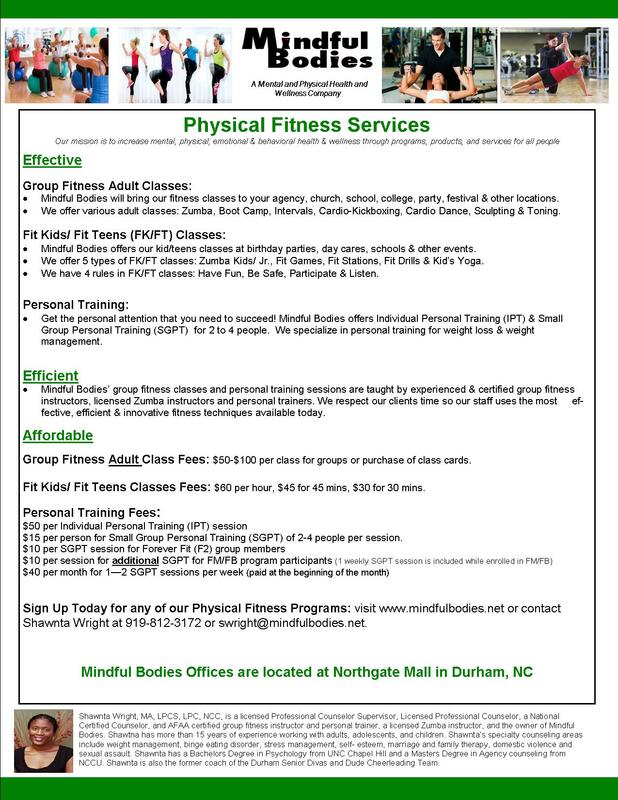 Please contact us if you need Fitness classes this summer at your summer camp, after-school program, day care, church program, birthday party, etc. 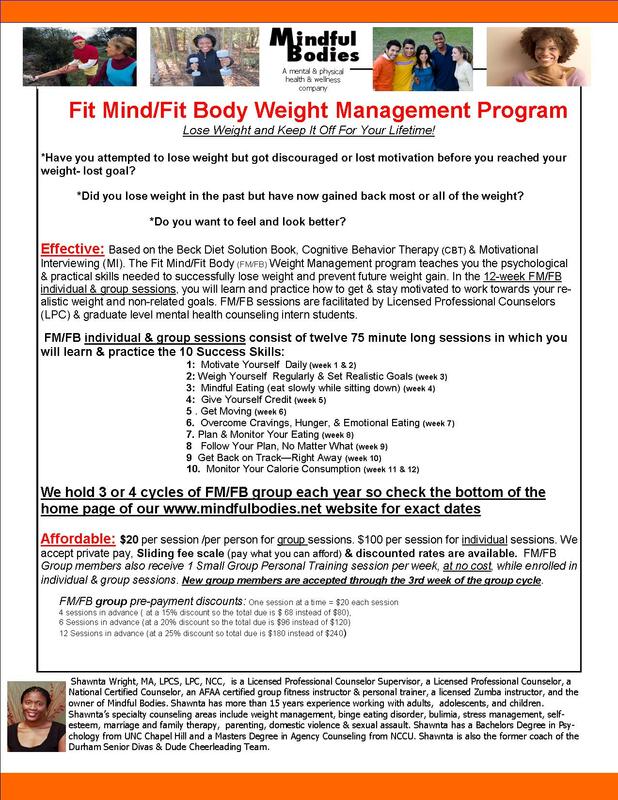 Our next 12 week Fit Mind/ Fit Body (FM/FB) weight management In-Person groups will be held on Mon nights from 7 – 8:15pm on 4/22/19 – 7/15/19 (no group on Memorial Day 5/27) & 9/9/19 – 12/2/19. Make-Up sessions will be offered, as needed, for missed sessions. More details about the FM/FB group are located on our mental health page of this website. Pre-registration & an intake session are required for group attendance so contact Shawnta Wright at 919-812-3172 for more information. New FM/FB group members can be added until the 3rd week of group cycle so you can still enroll in a group after the group start date. We also offer individual FM/FB sessions if the group sessions won’t fit your schedule or needs. We will hold a 12 week Bulimia Nervosa (BN) & Binge Eating Disorder (BED) Cognitive Behavioral Therapy (CBT) group on Thurs nights from 7 – 8:15 pm 4/25/19 – 7/18/19 (no grp on memorial day week 5/28) & 9/12/19 = 12/5/19. Make-Up sessions will be offered as needed, for missed sessions. More details about the BN & BED group are located on our mental health page of this website. Pre-registration & an intake session are required for group attendance so contact shawnta wright at 919-812-3172 for more information. New group members can be added until the 3rd week of group the group cycle so you can still enroll in group after the group start date. We also offer individual mental health counseling sessions for general weight management & eating disorders if the group sessions won’t fit your schedule or needs. Mark your calendars for the GAINS Fit Retreat on Thurs. May 16 – Sun. May 19, 2019, in Myrtle Beach at the Marina Inn @ Grande Dunes Hotel for a weekend full of fun, fitness & fellowship. Register to attend the retreat at www.gainsfitretreat.com & use Matthew Thompson or Shawnta Wright as the instructor/ person who referred you to the retreat & you automatically become part of TEAM MINDFUL BODIES & will be given a Mindful Bodies t-shirt & other prizes. FOR ZUMBA INSTRUCTORS ONLY At Lakewood YMCA in Durham NC from 1 – 4 pm (Please note that Jam sessions can’t be confirmed with Zumba until 10 weeks prior so some of the dates that are more than 10 weeks away may change. Please log into your ZIN account on Zumba.com to register for the confirmed sessions. Mindful Bodies is hosting Mental Health Professionals & Graduate Students Networking & Self Care Events, on the 2nd Sunday of every other month, at Mindful Bodies’ office: For all of the 2019 meetings, we will spend a portion of the meeting reviewing the vision boards we created in the Jan meeting. 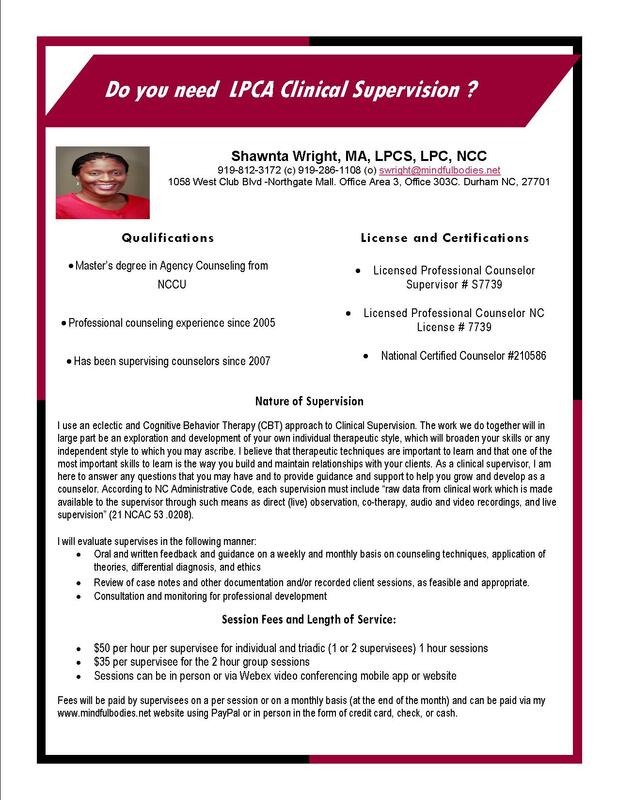 Mindful Bodies, Shawnta Wright is an LPC-S & she offers clinical supervision to LPC-As. The cost is $35 for 2 hr group supervision (3 – 12 supervisees) & $50 for 1 hr individual (1 or 2 LPC-As) supervision sessions. 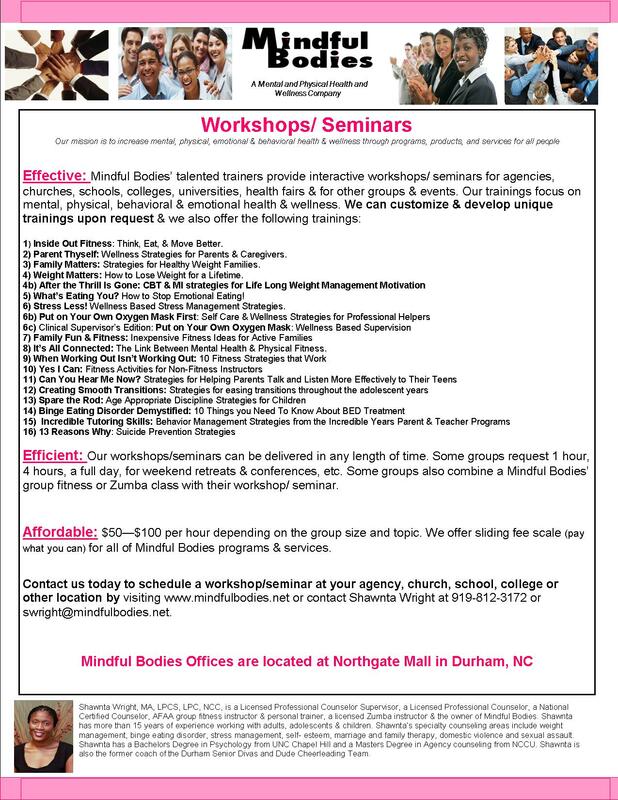 For more information about any of Mindful Bodies programs and services, contact Shawnta Wright at swright@mindfulbodies.net or (919)812-3172.